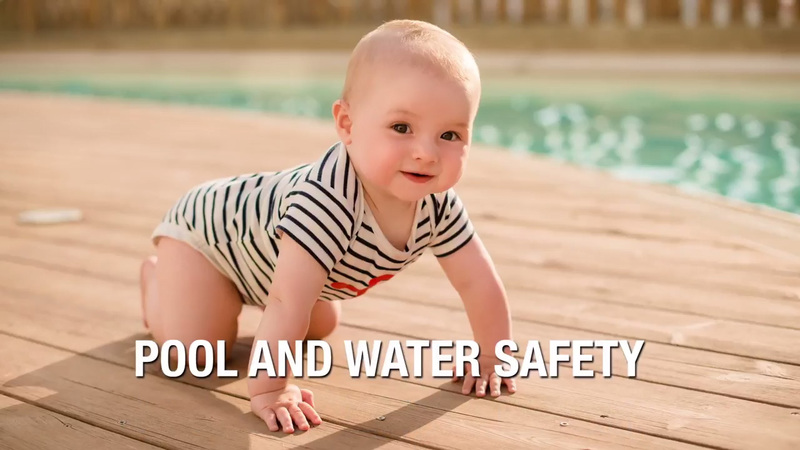 - Pool and water safety is extremely important, and I ask parents to really focus and hear me out here because the accidents happen so quickly, and they happen silently. First off, I would make sure or implore with parents who have a pool or a spa to make sure that you have it covered and make sure that it is a current, up to regulation cover, whether it's a fencing, an actual cover, or a net, it's really up to you. - So we recommend a pool fence that blocks access from the house around the perimeter of your pool. This pool fence has a gate that can only be accessed by an adult. The latch is up high. Having a pool fence versus a cover is important because a cover may not necessarily be put back in place. Say, you're taking a break to answer the phone or take a lunch break or whatever, so having the gate closed is the safest way to ensure your pool is safe. - But then I would also recommend a second layer of protection, which is making sure that any perimeter door in your home that could lead to that outside body of water is locked. So perimeter doors and covers are paramount for pools and spas. When you have a baby, it's important to make sure that you have what's called touch supervision when you're in the water with your child. So don't trust the little floaties that go on their arms or any other little floating device with you in the lounge chair and them in the pool. That does not work out, and that is not recommended. So make sure that you're always right there and focused on your little one. In addition to the pool, make sure that when your child is in the bathtub, that you have touch supervision there, as well, and that you never leave your child unattended in any body of water. One thing you may not have considered, after a rain, you need to walk out into your yard, survey the area, and make sure that perhaps a pot or one of your children's toys or a water table hasn't collected the rainwater and becomes a potential drowning hazard later for your child when you send them out into the yard to play. Make sure that you topple those, and make sure that they're empty so that your child can play safely in your yard.